O Jogo de Ação e Reação Modela os Circuitos do Cérebro is the Portuguese translation of Serve & Return Interaction Shapes Brain Circuitry, part of the Center’s three-part video series Three Core Concepts in Early Development. One of the most essential experiences in shaping the architecture of the developing brain is “serve and return” interaction between children and significant adults in their lives. Young children naturally reach out for interaction through babbling, facial expressions, and gestures, and adults respond with the same kind of vocalizing and gesturing back at them. 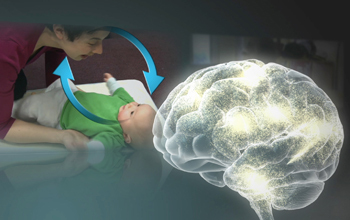 This back-and-forth process is fundamental to the wiring of the brain, especially in the earliest years. This video is one of the first multimedia resources from the Center on the Developing Child to be translated and adapted for a Brazilian audience as part of its collaboration with local experts to use the science of child health and development to guide stronger policies and larger investments to benefit young children and their families in Brazil. The Center collaborates with the David Rockefeller Center for Latin American Studies at Harvard University, Fundação Maria Cecilia Souto Vidigal, the Faculty of Medicine at the University of São Paulo, and Insper.